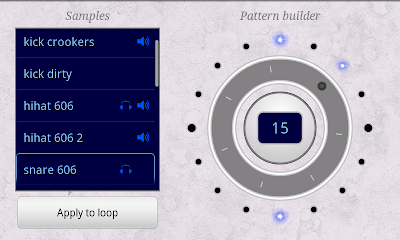 In the next day or so I will be releasing the final significant update to Beat Dialer - version 1.6. Proper handling of unexpected errors (sorry, Samsung users...) and I've hopefully fixed the Samsung AudioTrack buffer size bug. Larger LEDs for the 4 beats in the bar. Improved pattern mixdown time (2x faster). Changes are now applied at the end of the bar. After significant deliberation I decided to change the left "dial" to a list. This was because the information stored in the left dial was qualitatively independent - there is no consistent and measurable "distance" between a kick drum from a free Crookers sample pack, a hi-hat from a 606 and a snare drum from a 606. As such, a dial that moved by constant distances was not appropriate. Using a dial also meant that a user could only see one sample name at a time. On the other hand, there is a measurable distance between steps in in a bar - making a dial appropriate. 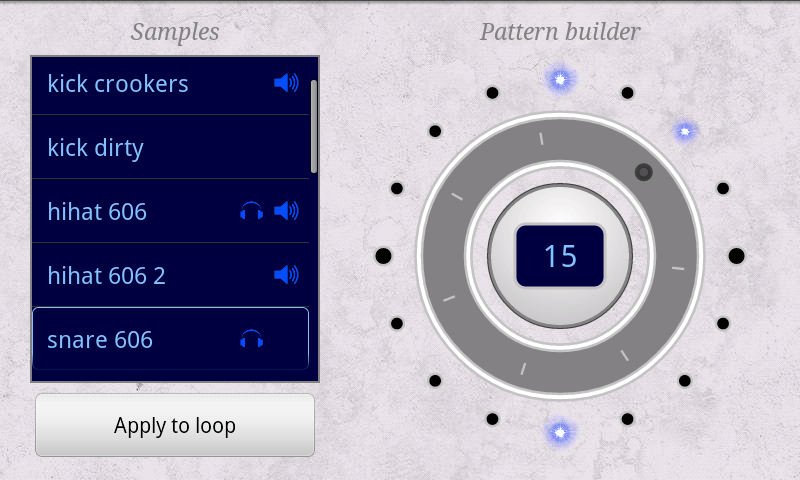 Beat Dialer now works in a slightly different way - you queue changes to the patterns for one or more samples then "apply" the changes to the audio loop. This allows for more logical progression between patterns - helpful if you are using Beat Dialer for performance-backing beats. The headphones icon indicates that there are "un-applied" changes, the speaker icon indicates that that sample is playing at some point in the loop.